On Saturday, our family had my graduation celebration combined with Jubilee's 13th birthday celebration. 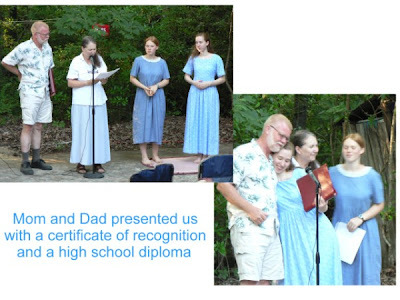 Though she turned 13 in April, our family has a tradition of combining the celebration of one sister's transition in to womanhood with another sister's graduation. It was a rather warm day to be doing things outside, but thankfully it didn't rain and we had a slight breeze come through. 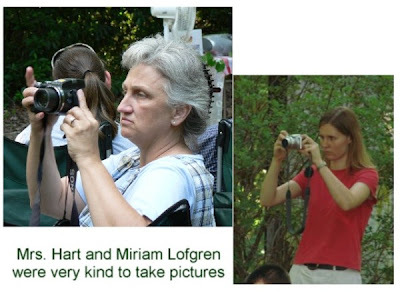 Miriam Hart spent the night with us on Friday, and it was a lot of fun to have her there as we got ready. She was a great help as we cleaned, cooked, and decorated. 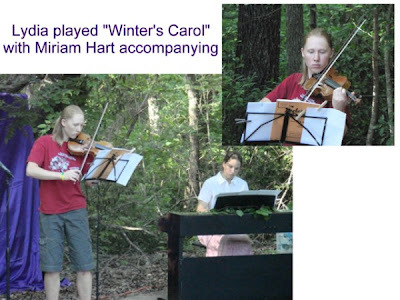 As she was involved in the program as well, it was a good time to practice together. It was also fun to just be together. Having her there helped me not get too stressed! People began arriving on Saturday at around 4 p.m. 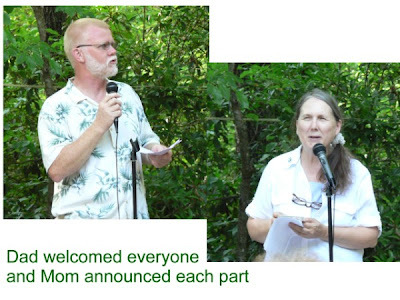 Although we'd planned to start the program at 4:30 p.m., it was closer to 5 p.m. by the time everyone had gathered. Jubilee and I shared the most things, but Elijah and Lydia each played a part, and Miriam Hart was involved in many things! It was so nice to have a lot of pictures to choose from! I've tried to put some together for this post, so as to not overwhelm you with too many photos! I'm very thankful to my parents for all the years of homeschooling me, and for the special celebration they helped put on for me! It's still hard for me to believe that I'm actually done with home education. Miriam sang beautifully, even though she only had 2 days to practice with the accompaniment CD! I choreographed this dance while keeping in mind that I had a very limited space on concrete on which to do it. 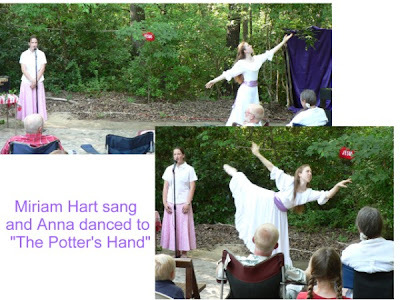 This song was my prayer: "Take me, mold me, use me, fill me, I give my life to the Potter's Hand. Call me, guide me, lead me, walk beside me, I give my life to the Potter's Hand..."
As is our family's tradition, Jubilee memorized and shared all 176 verses of Psalm 119. 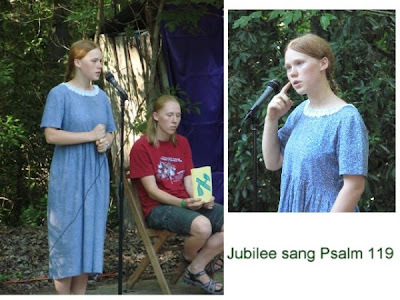 It's a very special Psalm to learn as we each turned 13 - it stresses the importance of learning God's Word and keeping it near us to guide our paths through life. Jubilee did very well! Singing for 20 minutes is not easy, but she sang beautifully! 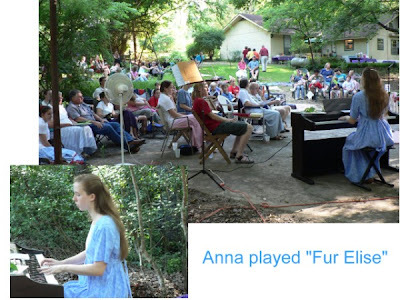 I had been working on "Fur Elise" for months, and had it memorized for quite a while. However, as is usually the case, I messed up on the thing I was least worried about! I was somewhat nervous and my fingers tripped up, but at least I was able to keep going. It is such a beautiful song, however, and I've really enjoyed playing it! Elijah has found a lot of really good books recently, and he shared some of them, as well as the magazine TableTalk, the Parental Rights Amendment, and the Bible memory system Memlock, which I have been using as well for the past few years. For the almost the past two years, I've worked on-and-off on memorizing the book of Ephesians. After the first year, I had it mostly down, but I didn't work on it for quite a while. Once it was determined that I'd share it at my graduation, I worked hard on getting the chapters really well-committed to memory. I really enjoyed learning Ephesians - it's a wonderful book, so full of the riches of God's grace! Learning it dramatically and taking the time to slow down and emphasize the words really helped ingrain it in me. These Scriptures are wonderful ones to have floating around in your mind! It took 15 minutes to share all 6 chapters, but all of them were so good, we didn't want to leave any out! 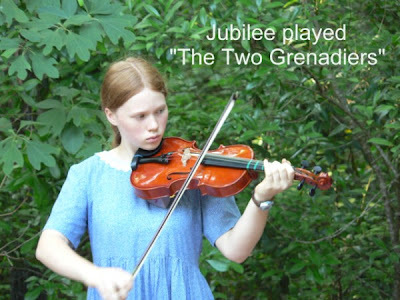 Jubilee has taken violin lessons for a few years, starting back in earnest 2 years ago, after a break. She's learning using the Suzuki method, and played a song out of book 2 quite well! 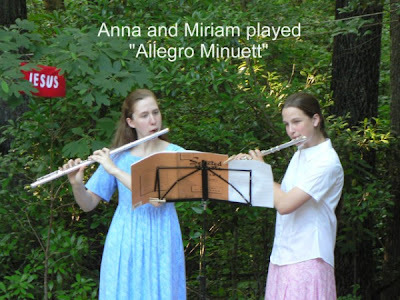 Flute duets are always more fun and prettier to play then flute solos, and it was nice to be able to play at my graduation with my good friend! Miriam had a book of duets out of which I picked this fun piece, and we had little more then 2 weeks to work on it. Everything went well, except for the fact that we forgot there would be a fan blowing to the side of us. Our last page kept fluttering, and, as we were almost done, completely turned itself! Everyone was understanding, however, and Lydia came to the rescue with a clothespin to hold it so that we could finish the song. Now I have an official diploma from the "Supreme is Jesus Family". But, you know what? It really doesn't feel that different to be a high school graduate! I made an old-fashioned spice cake and two chocolate oatmeal cakes on Friday morning, and Miriam and I decorated them on Saturday. She did Jubilee's, and I did mine. It was fun to go all-out pink on a cake! =) I'm not very skilled in manipulating icing, but I liked how it looked with chocolate chips spelling out the words and curled ribbon all around the edges. 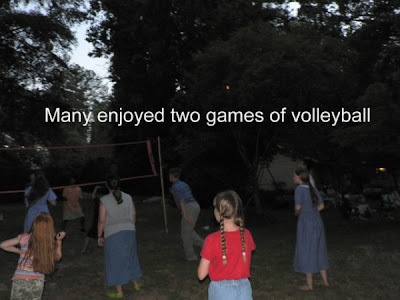 When we have any gathering with friends, volleyball is often the game we all enjoy playing together, and this time was no exception! We played two games while it was still light enough, then proceeded to dance! Dancing is wonderful exercise, and lots of fun to do together! Miriam and I wore full dresses, which made it even more enjoyable! 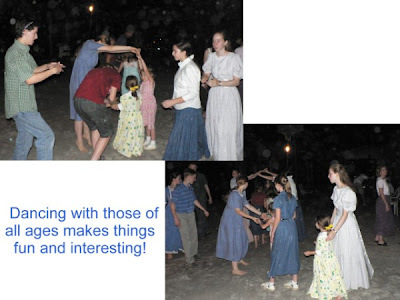 We had people from 4 years old up to parents dancing with us at different times. The little ones did very well, and all the big ones helped them know where to go. It was funny when they'd go down the line turning - you'd swing them, pass them to their partner in the middle, then tell the next person in line to catch them and swing them around, and so on. 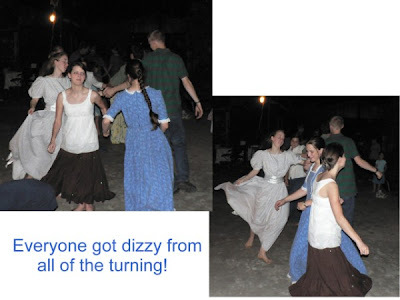 They were always quite dizzy at the end of it and looked like they didn't quite know where they were, but they had a lot of fun! We danced late into the evening, and people eventually decided it was time to leave. Not everyone stayed all evening, but a total of 76 people came to our home to help celebrate. Many friends found it hard to go, however, so it was 11 p.m. before the last car pulled away! All-in-all, it was a wonderful party, and I had a really good time! It's a great memory to carry with me. To God be the glory! He has been the strength and help that carried me through all the things I did while in high school, and He will be my support in the years and opportunities ahead. Your celebration sounds like a lot of fun - but also a lot of work for you! I hope you also get to have a day where people take care of you! looks like you all had a marvelous time! Congratulations on your graduation! I'm glad your special day went so well. We're sorry it didn't work out for us to be there! Everything was beautiful and so much fun. Wish we could have stayed a little later! 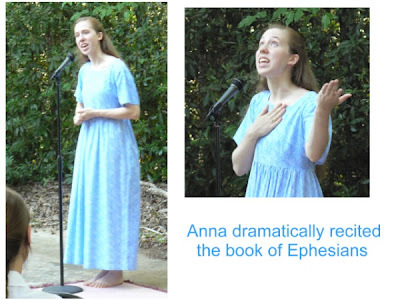 I am so impressed with your scripture recitations. Such amazing ability. You are both so talented in many areas. I will continue to pray for both of you as you enter new stages of life. P.S. Miriam did an excellent job "assisting" with everything! And all three of you looked beautiful! Congratulations to both of you as you enter new chapters in your lives! What a meaningful celebration to remember always! What a wonderful time your graduation must have been! Congratulations!! E: It was a lot of work, but I enjoy helping out with things! I would have felt rather lazy to let the others do the work! =) It's part of the fun to work to prepare for things, anticipating them as you do. Sammybunny, Elizabeth, and Darelina: Thank you! 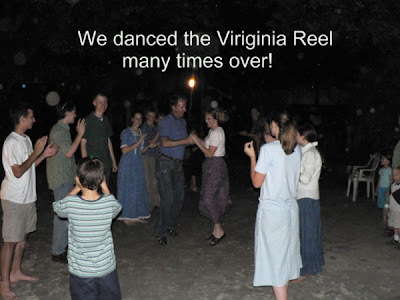 Ella: Many people didn't know the steps to the Virginia Reel, but everyone learned quickly. Even the little 5-year-olds soon caught on. It's fairly simple, and if you have a partner that knows what they're doing, you catch on quickly! I also called out the steps while we danced to help everyone stay together. Jody: I'm glad you could come! The Scripture memory took a lot of time, but it was a worthwhile thing to work on! Thank you for your prayers - I greatly appreciate them! Looks like y'all had fun! I wish I could have been there! I love the fact that some of y'all are barefoot in the pictures! I hate wearing shoes and and often go barefoot when ever I can. Thanks for sharing your special day with us! Sydney: I don't like shoes very much either, so I go barefoot as much as possible. It's just more comfortable! It was funny on Saturday, because mom announced to everyone that there were ants around so they should leave their shoes on. Sheepishly, Miriam, Jubilee, and I looked down at our barefoot feet. =) Oh well! 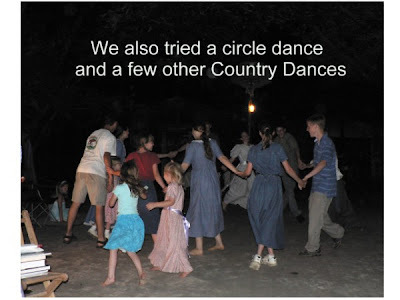 Later, when mom was making the presentations, called us her country girls, for we were comfortably barefoot! Ooooooh how I wish I could have been there. Congrats Anna!!!!!!! AND CONGRATS TO JUBILEE ON HER 13TH BIRTHDAY!HAPPY BIRTHDAY JUBILEE! I've been reading your blog for a while now but this is the first time I've commented. First, congratulations on graduating! It looks like you had a wonderful celebration. Quick question - the two cakes you mentioned sound delicious. I'm not much of a baker and you don't mention anything about the frosting. What would you recommend? Julie C. - a Yankee from Maine! Julie: Thanks for commenting! I always enjoy hearing from people who read our blog. I made the frosting for the cakes as well, using the same recipe, and just coloring Jubilee's blue. The recipe I use is fairly simple and very versatile. One of our favorites is to make mint frosting for the chocolate cake (it's delicious!) by adding a few drops of mint flavoring to the frosting. Anyways, you can find the recipe for this delectable frosting here: http://danceranna.com/lofgren-favorite-recipes/desserts/creamy-butter-froasting/ The only caution I have is that if you leave a cake out for too many days, the frosting will sour. However, keeping it in the fridge helps with that problem. Homemade frosting is definitely yummier then stuff from the store! 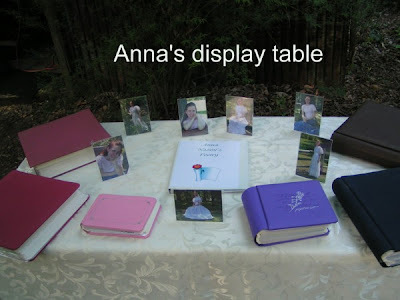 Wonderful - thank you Anna! And thank you for being such an inspiration and an example of what Godly young womanhood can be. 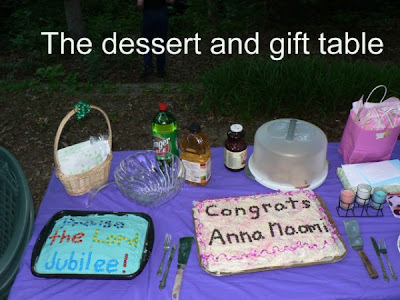 Congratulations Anna & Jubilee! I've never seen a celebration like this done at home before, and it's given me lots of ideas for when our girls grow up. 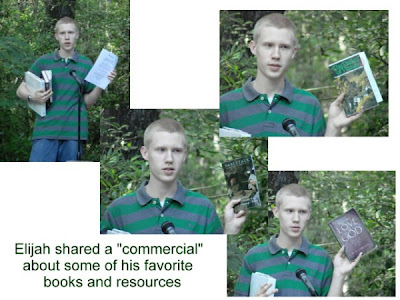 It's great to see the fruit of Christian Homeschooling. Julie: Glad I could be of assistance! Elijah: Thank you for dancing with me! It made the night really special to be able to dance with my older brother. Mrs. Claire: My parents have had celebrations at home for as long as I can remember. It works really well, and makes it more meaningful to be at home. It can be a lot of work getting everything ready, and sometimes meeting outside can be hard when it's hot, but in the end, it's a lot of fun! Wow! That looks like so much fun. :) You are a very accomplished young lady. I'll second you on dancing- it is so much fun and very good exercise, though I have never learned those particular dances. What a wonderful day this must have been for each of you. Congratulations on meeting two important milestones of life. Your gift of memorizing scripture is an encouragement to me. God's richest blessings on you! Looks like it was a fun and memorable day.It seems only fitting to have your graduation ceramony at home with family and friends. Wow, that looks like fun! Congratulations Graduates!